With their traditional green and yellow jerseys, Football Club de Nantes were always a unique presence in French football. Being one of the most successful and respected clubs in the country didn't hurt their cause, either; they can boast with eight Ligue 1 titles and three Coupe de France trophies. The club is also known for its collective-based style of play, often referred to by its fans as the "jeu à la nantaise". Stade de la Beaujoire in 2006. The club's history started in 1943, through a merger of five smaller local clubs. They started playing football at a professional level after WWII, but did not manage to achieve promotion to the top division until 1963. It was during this period that the club started developing its "jeu à la nantaise" style of play, mostly thanks to their coach at the time, José Arribas. The experiment quickly proved to be a complete success, as Nantes went on to win two consecutive Ligue 1 titles in 1965 and 1966. Nantes continued to perform at a high level throughout the 70s and the 80s, winning four additional Ligue 1 titles and their first Coupe de France between 1973 and 1983. These glory days were followed up with a long period of decline, which culminated in the club's relegation to the Ligue 2 in 1992. Nevertheless, Nantes managed to cheat fate on an administrative decision, which saw them change their name to FC Nantes Atlantique and continue competing at Ligue 1. With "jeu à la nantaise" making a comeback in the mid-90s, Nantes claimed two additional Ligue 1 titles and two Coupe de France trophies in the decade that followed. It could also have been a glorious moment beyond everything else in the club's history. In the 1995/96 they faced Juventus in the Champions League semi-finals. They won one of the matches, but lost 3-4 on aggregate. Juventus would later win the tournament. 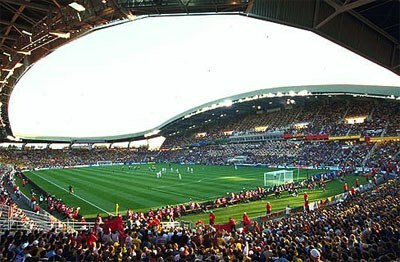 But with their financial situation worsening, Nantes could not keep the streak going and were eventually relegated to the Ligue 2 in 2007, for the first time in almost half a century. Shortly after that, the club reverted back to its old name and returned to the Ligue 1, where they still compete to this day. FC Nantes have changed their logo in several occasions. The main remaining feature is the ship, which associates with the town's near coast location. The current logo design of FC Nantes has been in use since 2009.